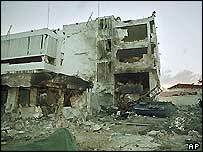 Ahmed Khalfan Ghailani faces charges of war crimes over the US embassy bombings in Tanzania and Kenya in 1998, which killed more than 200 people. 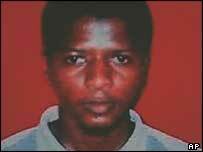 Mr Ghailani, a Tanzanian, was arrested in Pakistan in July 2004 and handed over to the US at the beginning of 2005. He was one of 14 detainees transferred in September 2006 from secret CIA prisons abroad to the Guantanamo Bay prison camp in Cuba. Charges brought by the Pentagon in March 2008 include murder, attacking civilians, conspiracy and providing material support to terrorism. The Pentagon was reported at the time to be seeking the death penalty if the conviction is successful. According to the transcript of a closed-door hearing in March 2007, Mr Ghailani admitted delivering explosives used to blow up the US embassy in Tanzania in 1998. However, he said he did not know about the attack beforehand and apologised to the US government and the victims' families, the transcript said. A short, squat man in his 30s, Mr Ghailani is said to have had dozens of aliases, including "Foopie" and "Ahmed the Tanzanian". He was number eight on the FBI's most wanted list - his baby-faced photograph belying the severity of the charges on which he was indicted by New York authorities in 1998. The Tanzanian national is accused of buying the truck that carried the bomb used in the Dar es Salaam attack. He and his accomplices are also accused of buying oxygen and acetylene tanks used to enhance the force of the explosion. He is also said to have escorted the bomb maker between Dar Es Salaam and the Kenyan city of Mombasa after the bomb was made as well as scouting the US embassy with the suicide bomb driver. The near-simultaneous bombings in August 1998 killed 213 people in Nairobi and 11 people in Dar Es Salaam as well as injuring thousands more. Mr Ghailani is thought to have been born on the Tanzanian island of Zanzibar in 1970 or 1974 - making him 39 or 35 years old. He is said to speak fluent Swahili and English. Analysts described him as a very important figure, who was probably sent to east Africa at the time of the bombings by Osama Bin Laden's second-in-command, Ayman al-Zawahiri. It is suggested that Mr Ghailani fled to Afghanistan after being indicted in 1998. According to the US transcript, he admitted visiting an al-Qaeda training camp in Afghanistan after the bombings. But he denied being a member of al-Qaeda. Mr Ghailani was reported to have been in the Liberian capital, Monrovia, in 2001, with another suspect in the embassy bombings, a Kenyan man Fazul Abdullah Mohammed. The UK's Observer newspaper reported in 2002 that the two men allegedly ran a lucrative al-Qaeda financing operation, trading illegal "blood diamonds" for cash. The paper said the operation ran into trouble in June 2001, when reports reached al-Qaeda that Mr Ghailani and Mr Mohammed were lavishing money on women, presents and alcohol. In May 2003, the FBI named Mr Ghailani on a list of seven people it suspected of concocting a fresh al-Qaeda plot, and increased the bounty on his head to $5m. On 25 July 2004 he was arrested in Pakistan along with his Uzbek wife. Pakistani officials at the time said Mr Ghailani's arrest was the most significant since the detention in March 2003 of Khalid Sheikh Mohammed, the suspected mastermind of the 11 September attacks on the US.